The holiday season is an important time for retailers, with crowds of people flocking to stores to buy gifts for everyone they know. Because this time of the year is so busy for retailers, stores are often crowded, leaving managers and owners to figure out how to deal with the crowds. Without proper precautions, crowds can be unruly, destructive, and dampen the overall atmosphere of your otherwise festive establishment. For this reason, we’ve compiled a list of tips to help retailers handle crowds during the holiday season. Long lines when waiting to check out are almost inevitable during the holiday season. However, there are steps you can take to make sure your lines don’t get out of control. Be sure to have belts or some other mechanism in place to keep lines organized and to avoid a confusing mass forming around your registers. Provide smaller items for sale or other interesting things for people to look at while they wait in line to avoid frustration. Consider offering Christmas cookies or bottled water to people waiting in lines. This expense will be minimal for you and is likely to keep your customers in a better mood while they wait. It’s also a good idea to provide signs, clear directions, or arrows on the floor that explain how to line up and where to go after a customer makes a purchase. 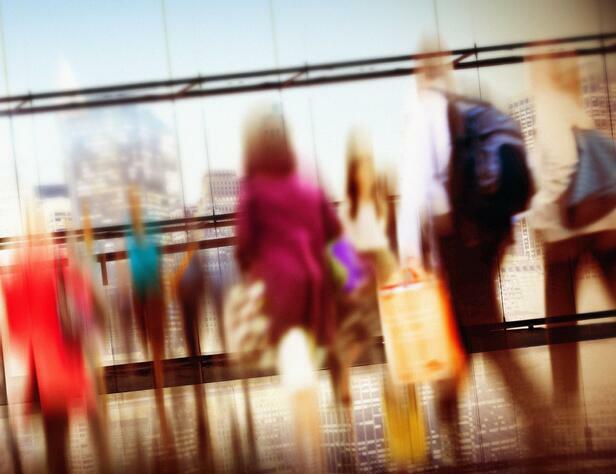 Properly training your staff is essential to crowd control in your retail store. If you’re hiring seasonal staff just for the holidays, it’s important that these staffers are just as aware of the store’s policies and products as your full-time employees. To control crowds in your store, your staff should be extremely helpful to customers, providing directions, assistance, and suggestions on relevant products. The quicker that customers can get to the item they want and make a purchase, the less crowded your store will be. A well-trained staff is the best way to ensure that your customers find their way and your store minimizes its crowds. One of the best ways to control crowds in your store before they happen is to clearly map out your store. Identify all entrances, exits, and important spaces for customers. Be sure to space out big-ticket items to avoid people crowding around one area. You should also place big-ticket items toward the back of the store to avoid large crowds toward the entrance that can make entering the store difficult for customers. Create clear paths between your items and place items and equipment strategically. You should also identify the proper places to position your staff to help manage traffic flow. Crowds can be problematic in your store, but they can lead to a huge problem in an emergency, especially if people panic. For this reason, it’s important to have an emergency response plan in place to avoid these problems. All of your employees should know where to go and what to do. They should be able to provide clear directions to patrons to help avoid panic and promote safety. You should also make sure there are clear paths to all exits and that fire alarms and alert systems are up to date. Having a solid emergency protocol can help avoid disaster in a crowded store during the holidays. One of the best things you can do for crowd control is to hire private security officers. Security officers are highly trained to keep calm in stressful situations and react appropriately. They will be able to provide clear directions to employees and patrons to help everyone keep calm and safe. Private security officers can also solve any altercations that arise from big crowds and keep an eye on everyone. They will also keep a clear head and provide directions during an emergency. When you hire private security officers in your retail store, you can be sure that any crowds will remain under control. For the past 26 years, USI has created safe, secure environments for commercial and government employees and customers by investing in our people, innovation and relationships. As engaged owner-operators, our investment begins with recruitment and screening to ensure we have the right people and continues through our policies and practices that enable USI to properly train and retain the best personnel.